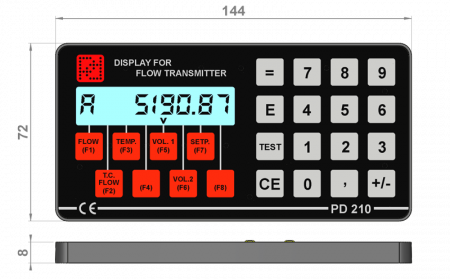 The PD210 Display Unit can be used to read out process variables from a PD340 Flow Transmitter, as well as for configuration. It can be mounted directly on the flow transmitter, or in a control panel. Whether standalone or part of a more complex process automation system, the flow transmitter offers the ability to locally indicate (within 100 metres) any of its measurement results on a small waterproof, panel mountable display and keyboard. The keys mainly act as measurement selectors (flowrate, volumes, temperature, etc. ), but can also be used as a means to input setpoints for batch or flowrate control and to reset volumes etc. 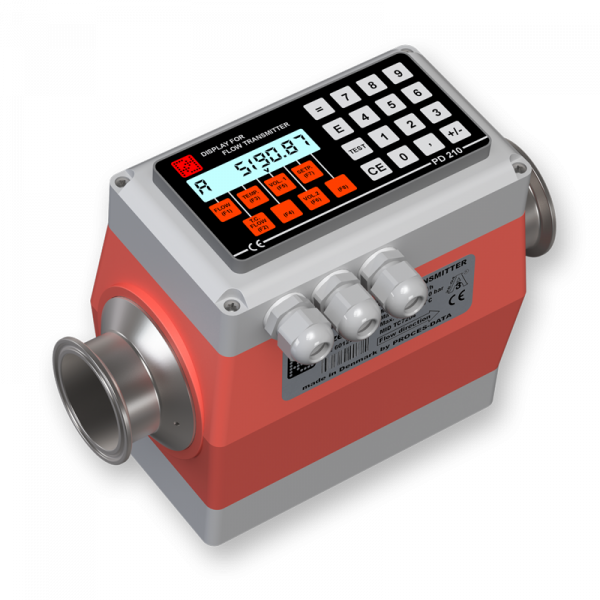 However, its versatility also extends to being able to fully configure the flowmeter for one of its many configurable tasks. Instantaneous value, flow: The unit displays the actual flow rate, e.g. in m3/h. 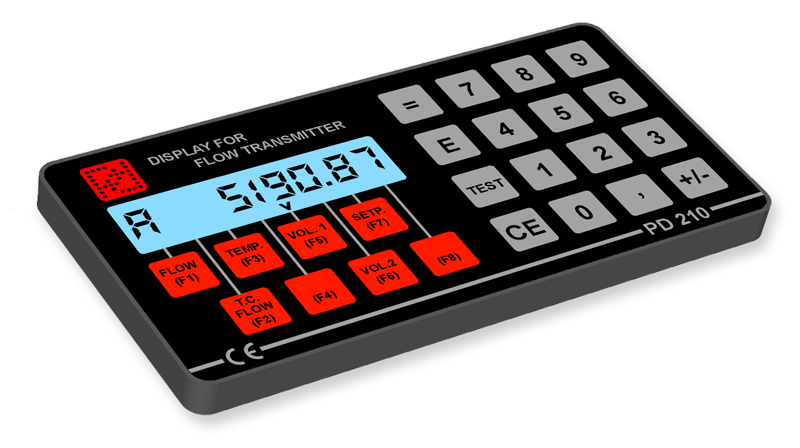 Accumulative Counter: The unit displays the total volume, e.g. in m3. Pre-set Counter: Before commencing a measurement, a SET-point is firstly entered. The start button connected to INPUT1 is pressed, the pre-set counter is reset automatically, and the OUTPUT2 is set. When the required volume has been reached, OUTPUT2 goes off. Instantaneous value, temperature: The display unit shows the actual temperature in °C. 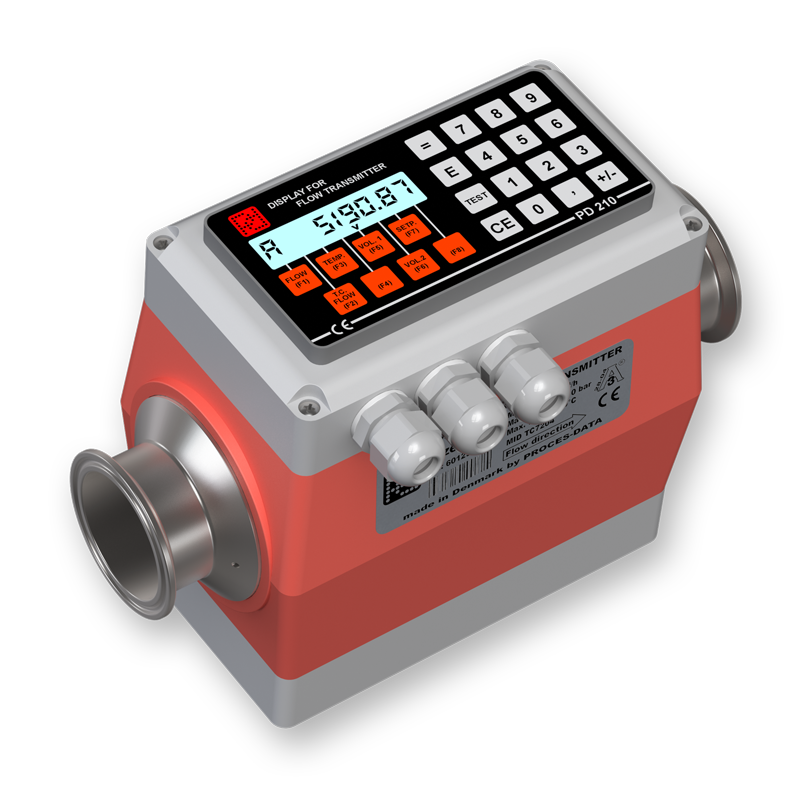 Configuration and calibration: The PD210 display unit may be used to carry out the full configuration of a Flow Transmitter. Fault finding: The flow transmitter is equipped with a comprehensive test system that is able to reveal faults arising from improper use of the transmitter, or from a malfunction of the transmitter during use. The PD210 is intended for fixed installations e.g. on a panel. Operational Ambient Temperature: -20°C to + 50°C. The unit is built into a case of NORYL PPO and sealed to IP 65. The Display Unit PD210 is connected to the Flow Transmitter using a 2-wire cable. The cable enables data to be exchanged between the Flow Transmitter and the display unit, and it also provides power for the module. The cable length may be up to 100 m.
All dimension are in mm. The Display Unit PD210 can be mounted directly on the Terminal Box of the PD340 and still be operated conveniently. This mounting style can be ordered as an option when ordering the PD340 and the PD210. The PD340 Flow Transmitter will then be delivered as one complete device, as shown.